The AW139 was originally designed and developed jointly by Agusta and Bell Helicopters and marketed as the Agusta-Bell AB139, being redesignated AW139 when Bell withdrew from the project. Since entering service in 2003, the AW139 has become one of AgustaWestland's most influential products; it has been subsequently developed into two enlarged medium-lift helicopters, the military-orientated AW149 and the AW189 for the civil market. In 1997, the Italian helicopter manufacturer Agusta launched a programme to develop a replacement for the Bell Huey family of helicopters (which had been built in very large numbers by Bell Helicopter and under license by Agusta) with a potential market of 900 aircraft being predicted. In 1998, Bell and Agusta entered into an agreement, setting up a joint venture, Bell/Agusta Aerospace Company (BAAC), to develop two aircraft: a conventional helicopter and a tiltrotor aircraft. These became the Bell/Agusta AB139 and Bell/Agusta BA609 respectively. Bell was to be the leading partner for the development of the BA609 while Agusta would be the lead partner for the AB139; it was intended for production, sales, and support to be shared. On 26 September 2000, the first order for the type was placed by Bristow Helicopters. The first preproduction helicopter flew on 3 February 2001 at Vergiate in Italy, with two further AW139s also participating in flying trials. The first production AW139 made its first flight on 24 June 2002. European JAA certification was received in June 2003, and its FAA type certificate followed in December 2004. By May 2005, the AW139 had received in excess of 100 orders worldwide. In the US, the type was marketed under the designation US139, and was entered into the US Army's Light Utility Helicopter competition. One key market for the AW139 was the oil & gas industry, which required helicopters of increased endurance for offshore operations. In 2005, AgustaWestland bought out Bell's 25% share in the program and all of its rights to the AW139 for $95 million. In April 2008, AgustaWestland revealed that it was in the process of certifying an increase in the AW139's max gross weight to 14,991 lb (6,800 kg) to better compete in long-range markets served by helicopters such as the larger Sikorsky S-92 and Eurocopter EC225. In 2007, a second production line at the AgustaWestland Aerospace plant in Philadelphia, United States was established; the Philadelphia plant produced its 200th AW139 in September 2014, at which point U.S. production was intended to reach 40 units per year in the near future. By 2011, AgustaWestland was producing 90 AW139s a year; 9.5% of the company's overall revenue in 2010 was attributed to the type. By 2013, a combined total of 720 AW139s had been sold to over 200 operators in 60 different countries. In 2011, a military-configured variant, the AW139M, was revealed by AgustaWestland. It was promoted at the US market, including for the U.S. Air Force's Common Vertical Lift Support Program. The AW139M is equipped with a high definition forward-looking infrared (FLIR), self-protection system, heavy-duty landing gear, and has low thermal and acoustic signatures; a significant proportion of the equipment is sourced from American manufacturers. Options offered include an external stores system including various armaments, armored seats, self-sealing fuel tanks, and a full ice-protection system for all-weather operations. The AW139 serves as the basis for AgustaWestland's wider business strategy, under which it aims to produce a standardised family of helicopters with common design features. The sharing of components and design philosophies is intended to simplify maintenance and training for operators; commonality also lowers the production costs. The AW139 was the first of this group, and as of 2014, it was to be joined by the larger AW149 and AW189, aimed at military and civilian customers respectively. Advances made in the development of new models are intended to be transferrable onto existing family members, decreasing the cost of future upgrades for the AW139. In June 2010, it was announced that AgustaWestland and Rostvertol would build a manufacturing plant in Tomilino, Moscow Region, where it was initially planned to produce AW139s by 2012. HeliVert, a joint venture between AgustaWestland and Rostvertol, commenced domestic production of the AW139 in 2012, at which point it was planned that between 15 and 20 helicopters would be produced per year. The first AW139 to be assembled in Russia made its first flight in December 2012. In January 2013, the Russian Defense Ministry was reportedly considering placing an order for seven AW139s. In January 2014, HeliVert received a Certificate of Approval from the Aviation Register of the Interstate Aviation Committee to commence production of commercial AW139s. In September 2014, a certificate was granted to perform comprehensive maintenance and servicing of the type at the Tomilino facility. In 2015, AgustaWestland unveiled an AW139 variant with an increased gross weight of 7 tonnes, enabling a range of 305 km while carrying 12 passengers; existing AW139s can also be rebuilt to the newer heavy-weight model. The heavier airframe comes at the expense of decreased hot and high performance. In November 2015, AgustaWestland demonstrated a 60-minute "run-dry" test (no oil) of an AW139's main gearbox, 30 minutes greater than any other certified rotorcraft at the time. AgustaWestland has also developed a smaller derivative, the AW169. The AW139 is a conventional twin-engine multi-role helicopter. It has a five-bladed fully articulated main rotor with a titanium hub and composite blades and a four-bladed articulated tail rotor. It is fitted with retractable tricycle landing gear, the two aft wheels retracting into external sponsons which are also used to house emergency equipment. It is flown by a crew of two pilots, with up to 15 passengers accommodated in three rows of five. The AW139 had been aimed at a vacant niche in the market, sitting below larger types such as the Eurocopter AS332 Super Puma and Sikorsky S-92, and above smaller ones like the Bell 412 and Eurocopter EC155. Rotor & Wing has described the AW139's flying attitude as 'docile and predictable'. The AW139 is powered by two FADEC-controlled Pratt & Whitney Canada PT6C turboshaft engines; the FADEC system seamlessly adjusts the engines for pilot convenience and passenger comfort, and can automatically handle a single-engine failure without noticeable deviation. It was constructed with maintenance requirements in mind; critical systems can be readily accessed, where possible the number of parts has been reduced, and many components have been designed for an extended lifecycle; a Health and Usage Monitoring System (HUMS) is also equipped. In excess of a thousand customizable items of equipment can be configured per customer demand, including auxiliary fuel tanks, rescue hoists, cargo hooks, search and weather radar, ice protection systems, external cameras and searchlights, and seating arrangements. Large sections of the AW139 have been developed and produced by a range of different companies. Airframes are typically produced by PZL-Świdnik, who delivered their 200th airframe in April 2014. Pratt & Whitney Canada produce the type's PT6C turboshaft engines, while the primary and secondary transmissions were developed by Westland GKN and Kawasaki Heavy Industries respectively. A significant portion of the avionics are sourced from Honeywell. Turkish Aerospace Industries has been subcontracted to manufacture various elements of the AW139, including the fuselage, canopy, and radome. Final assembly of most AW139s is performed at AgustaWestland's facilities in Philadelphia, United States, and Vergiate, Italy; those destined for customers within the Commonwealth of Independent States are typically assembled by a third final manufacturing plant in Tomilino, Moscow operated by HeliVert. The Irish Air Corps was the first military operator of the type, having taken delivery of its first AW139, of a batch of six, in August 2006. The United Arab Emirates Air Force and the Qatar Air Force became the second and third military operators of the AW139, having ordered 9 and 18 of the type respectively. A specialised military variant, the AW139M, was later launched, for which the Italian Air Force was the launch customer. Designated as HH-139A in Italian service, they are used for combat search and rescue (CSAR) operations. In October 2012, the Royal Thai Army ordered a pair of AW139s; a further eight were produced in October 2015. In February 2006, Mitsui Bussan Aerospace signed a $100 million contract for 12 AW139s and an exclusive distribution agreement for the AW139 in Japan. In October 2006, the Japan Coast Guard announced its selection of the AW139 as the replacement for its Bell 212 search and rescue fleet; by early 2011, 18 AW139s were on order by the Japan Coast Guard through Mitsui Bussan as the distributor, a total of 24 are expected to be ordered. The Japanese National Police Agency placed multiple orders for the AW139; other organisations in the nation have used the type for firefighting and disaster relief operations. In the North American market, CHC Helicopter was the first operator of the type. In 2012, CHC became the largest operator of the AW139 in the world, at that point operating a fleet of 44 in search and rescue, emergency medical service and offshore transport missions. In 2015, responsibility for the maintenance of CHC's AW139 fleet was reorganized under their helicopter support division, Heli-One; activities include post-delivery modifications and engine overhauls. Qatar-based firm Gulf Helicopters has emerged as one of the largest AW139 operators worldwide, first ordering the type in 2007 for offshore transport duties; it has since become an authorized service center and training center for the AW139. Malaysian operator Weststar Aviation has the distinction of being the biggest operator of the AW139 in the Asia Pacific; as of February 2014, the company has ordered a total of 34 helicopters. Since taking delivery of their first AW139 in December 2010, Weststar has typically employed the type in support of offshore oil and gas operations. In July 2014, AgustaWestland announce that the global fleet had accumulated in excess of one million flight hours; by this milestone, a total of 770 AW139s had been produced. 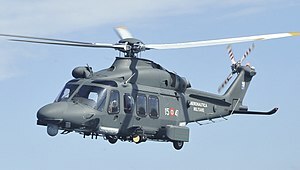 On 24 May 2016, AugustaWestland parent Leonardo-Finmeccanica announced that Pakistan had signed a contract for an undisclosed number of AW139s as part of a fleet renewal programme spread over several batches, including a logistic support and training package. The AW139s, deliveries of which are expected in 2017, will be used to perform search-and-rescue (SAR) operations across the country. A total of 11 AW139s are already in service in Pakistan, with five aircraft operated for government relief and transportation duties. On 24 September 2018, the United States Air Force announced that the MH-139 (an AW139 variant) had won a competition to replace the Air Force's Vietnam-era UH-1Ns. The Air Force will buy up to 84 MH-139s, with initial delivery set for 2021. Original Italian-built production aircraft, 54 built. Designation change from 55th aircraft onwards, built in Italy. Long nose variant with increased room for avionics built in Italy and the United States. Militarised variant, capable of carrying various weapons payloads. Italian Air Force designation for ten search-and rescue configured AW139Ms. Italian Air Force designation for two VIP configured AW139s. Militarised variant, was the AgustaWestland proposed entry for the US Army Light Utility Helicopter programme in partnership with L-3 Communications. Military variant to be American-built that is based on the AW139. To replace the US Air Force's UH-1N fleet with the first four helicopters to be delivered in 2021. The AW139 is popular for all types of operators both commercial and private. On 13 March 2014, Haughey Air AW139 (registration G-LBAL) crashed shortly after takeoff from Gillingham, Norfolk, United Kingdom, killing all four people on board. On 29 December 2018, a United Arab Emirates emergency medical services AgustaWestland AW139 on a mission to lift an injured person clipped the world's longest zip line and crashed in Jebel Jais, Ras Al Khaimah, United Arab Emirates, killing all four crew members. On 2 February 2019, an AW139 operated by Caverton Helicopters carrying Nigeria's Vice president Yemi Osinbajo crash-landed in Kabba, Kogi State. Though there were no casualties, the closeness of the crash to the 2019 presidential election fueled speculation of possible foul play, but Caverton attributed the crash to bad weather. Guardia Costiera AW139 with engine doors, main gearbox sliding fairing and nose cowling opened. ^ Huber, Mark. "Russia Balks at 35-AW139 Order." AIN Online, 2 October 2013. ^ a b "US Corporate Operator Signs Contract For Two AW139 Helicopters." Archived April 7, 2014, at the Wayback Machine AgustaWestland, 18 June 2014. ^ Niccoli 2001, p. 158. ^ a b c d e f g Bower, Ron. "The AB139: Filling The Market Gap." Rotor&Wing, 1 May 2005. ^ Jackson 2003, p. 227. ^ Niccoli 2001, p. 163. ^ a b c "AW139, setting the standard in its category." Archived April 7, 2014, at the Wayback Machine helicomag.com, 14 June 2012. ^ Jackson 2003, p. 31. ^ "Mission-Configured US139 Demonstrates Ability To Meet And Exceed Requirements." Archived April 7, 2014, at the Wayback Machine AgustaWestland, 21 December 2005. ^ Kay, Marcia Hillary. "40 Years Retrospective: It's Been a Wild Ride" Rotor & Wing, August 2007. Accessed: 8 June 2014. Archived on 8 June 2014. ^ Bell Helicopter Sells Interest In AB139 Joint Venture " Aero News, 22 November 2005. ^ McKenna, Thomas. "Rotorcraft Report: AgustaWestland Bolsters AW139, Racks Up Orders." Rotor&Wing, 1 April 2008. ^ a b c Osborne, Tony. "PAS 2011: AW139 has 'changed' AgustaWestland's behaviour". Rotorhub. Shephard Media. 20 June 2011. Retrieved 11 November 2012. ^ "AgustaWestland Philadelphia Delivers 200th AW139." aviation.ca, 18 September 2014. ^ "AgustaWestland Debuts the AW139M Helicopter." Archived April 7, 2014, at the Wayback Machine AgustaWestland, 17 February 2011. ^ a b c Head, Elan. "Upward Trend." Vertical, 22 January 2014. ^ a b "Italian, Russian Firms to Build Helicopter Factory | Business". The Moscow Times. Retrieved 2012-09-14. ^ "Exclases Russia buys three corporate AW139s from HeliVert." Vertical, 17 September 2014. ^ "Russia to Buy 7 AW139 Helicopters." RIA Novosti, 28 January 2013. ^ "HeliVert gets approval for production of commercial AW139." corporatejetinvestor.com, 30 January 2014. ^ "HeliVert receives approval to work on AW139s in Russia." Vertical, 15 September 2014. ^ Turnbull, Grant. "AgustaWestland unveils heavier AW139". Rotorhub, Shephard Media. 3 March 2015. Retrieved 9 March 2015. ^ "AgustaWestland sets new safety benchmark for helicopter gearboxes". Vertical Magazine. 11 November 2015. ^ Niccoli 2001, pp. 158–159, 162. ^ a b "Swedish Maritime Administration Orders Seven AW139 Helicopters for Search and Rescue." Archived 2014-04-13 at the Wayback Machine Shipping & Marine, 4 February 2013. ^ a b "AW139 fleet passes 1,000,000 flight hours milestone". AgustaWestland. 14 July 2014. Archived from the original on 28 July 2014. ^ a b "Helicopter News." Archived December 24, 2010, at the Wayback Machine propilotmag.com, 5 April 2014. ^ "AW139 Program - Turkish Aerospace Industries, Inc". Tai.com.tr. Archived from the original on 2014-03-20. Retrieved 2014-03-20. ^ a b c "Year in Review—Products: Pick of the Litter." Rotor&Wing, 1 December 2006. ^ Hoyle, Craig. "PICTURE: Qatar accepts first AW139 military helicopter." Flight International, 25 November 2009. ^ Peruzzi, Luca. "PICTURES: Italian air force fields first search and rescue HH-139A." Flight International, 12 March 2012. ^ Hoyle, Craig. "Thai army to boost AW139 fleet size." Flight International, 12 October 2015. ^ "AgustaWestland receives orders for 8 more AW139 helicopters." Shephard Media, 9 March 2011. ^ English, Jennifer Leach. "Japan National Police Agency Orders Another AW139." AIN online, 16 April 2014. ^ "CHC Helicopter Signs Contract for 10 AW139s." asdnews.com, 10 July 2012. ^ "CHC orders additional Sikorsky S-92 and AgustaWestland AW139 helicopters, enters into agreements for corresponding MRO capabilities and agrees to additional $225M lease finance facility." Heli-One, 19 June 2015. ^ "Gulf Helicopters AW139 fleet achieves 50,000 hour milestone." Arabian Aerospace Online News Service, 31 March 2014. ^ "Weststar Orders 10 Additional AW139 Helicopters". AgustaWestland. Archived from the original on 28 February 2014. Retrieved 28 February 2014. ^ "Weststar Aviation Services Takes Delivery of Its First AW139." Archived 2014-03-13 at the Wayback Machine AgustaWestland, 2 December 2010. ^ "Pakistan signs up for more AW139 helos". IHS Jane's 360. 26 May 2016. ^ Insinna, Valerie (24 September 2018). "The Air Force picks a winner for its Huey replacement helicopter contract". defensenews.com. Retrieved 25 September 2018. ^ a b c d "Type Certificate Data Sheet: AB139-AW139." European Aviation Safety Agency, Issue 15, 23 January 2012. ^ "AW139M." Archived April 19, 2012, at the Wayback Machine AgustaWestland, Retrieved: 5 April 2014. ^ "AgustaWestland VH-139A". Aviationsmilitaires.net. 2013-05-07. Retrieved 2014-07-15. ^ "AgustaWestland and L-3 Join Forces on Army LUH - Team US139". www.defense-aerospace.com. Retrieved 21 November 2018. ^ "MH-139". Boeing. Archived from the original on 23 September 2017. Retrieved 23 September 2017. ^ Haracic, Armin (18 September 2017). "Boeing submits bid to replace the Air Force's Huey helicopters". Defense News. Washington, D.C. Archived from the original on 18 September 2017. Retrieved 23 September 2017. ^ Trevithick, Joseph (24 September 2018). "Dark Horse Contender Boeing Snags Air Force Deal To Replace Aging UH-1N Hueys With MH-139". The Drive. Archived from the original on 25 September 2018. Retrieved 25 September 2018. ^ Insinna, Valerie (24 September 2018). "The Air Force picks a winner for its Huey replacement helicopter contract". Defense News. Washington. Archived from the original on 25 September 2018. Retrieved 25 September 2018. ^ a b c d e f g h i j k l m n o p q "World Air Forces 2018". Flightglobal Insight. 2018. Retrieved 4 August 2018. ^ Muntz, Marco (June 2015). "Presidential AW139 for Ivory Coast". Air International. Vol. 88 no. 6. p. 8. ISSN 0306-5634. ^ "I MEZZI - AW139 NEMO - Capitanerie di porto - Guardia Costiera - www.guardiacostiera.it - Sito Ufficiale". www.guardiacostiera.it. Archived from the original on 2014-02-28. Retrieved 2014-02-28. ^ Ziezulewicz, Geoff (4 August 2016). "Italian coast guard orders two Leonardo AW139 helicopters". United Press International. Retrieved 5 August 2016. ^ "HeliHub.com Nepal Army procures one AW139 and two H125s". helihub.com. Retrieved 14 July 2018. ^ "Government of Turkmenistan". helis.com. Archived from the original on 7 August 2017. Retrieved 7 August 2017. ^ "Abu Dhabi Police AW139". Air International. Vol. 74 no. 5. June 2008. p. 6. ISSN 0306-5634. ^ "Polícia Federal do Brasil adquiriu helicóptero AW139". Piloto Policial. 12 June 2012. Retrieved 12 June 2012. ^ "Carabineros de Chile AW139 achieves operational readiness." Vertical, 16 April 2015. ^ "AgustaWestland AW139 in China Ministry of Public Security". helis.com. Retrieved 19 December 2017. ^ "FOTO: Hrvatska policija dobila novi helikopter vrijedan 119 milijuna kuna". poslovni.hr. Retrieved 10 January 2017. ^ "Cyprus Police - Cyprus Police Aviation Unit". Retrieved 8 July 2013. ^ "Estonia's Border Guard fails to plan ahead". helihub.com. Retrieved 21 February 2013. ^ "Indo Defence 2016: Indo SAR AW139 up close (video) - RH - Rotorhub - Shephard Media". www.shephardmedia.com. Retrieved 6 July 2018. ^ "Italian Police Takes Delivery of its Fifth AW139 Helicopter". AgustaWestland. Archived from the original on 28 February 2014. Retrieved 28 February 2014. ^ "Guardia di Finanza - AW139". Gdf.gov.it. Archived from the original on 2014-03-06. Retrieved 2014-02-28. ^ Pittaway, Nigel (February 2019). "AW139 parapublic sales". Air International. Vol. 96 no. 3. p. 93. ISSN 0306-5634. ^ "Nkaissery receives 15-seater choppers of AW139 Model at cost of Sh683 Million at Wilson Airport". nepjournal.com. Archived from the original on 27 April 2016. Retrieved 12 December 2017. ^ "Lebanese Government Aviation Unit". aeroflight.co.uk. Retrieved 5 January 2019. ^ "AW139 in Jabatan Bomba dan Penyelamat Malaysia". Helis.com. Retrieved 30 April 2015. ^ "Malaysia maritime agency receives three AW139 helicopters". Flight International. Retrieved 14 December 2012. ^ "AgustaWestland Delivers Two More Corporate AW139s To Malaysian Clients". ^ "Police air wing unit receives AW139 helicopters". NST. ^ "Laatse vlucht Kustwacht AS-332 helikopter". Kustwacht. 21 October 2012. Archived from the original on 1 June 2013. Retrieved 2013-05-01. ^ "KLPD neemt eerste AW139-transporthelikopter in ontvangst". Luchtvaartnieuws. Archived from the original on 2013-07-03. Retrieved 2013-05-02. ^ "Royal Oman Police Air Wing AW139 Deliveries Commence". Air International. Vol. 74 no. 3. March 2008. p. 8. ISSN 0306-5634. ^ "Así son nuestras unidades: helicóptero Helimer AW 139" (in Spanish). Sociedad de Salvamento y Seguridad Marítima. Retrieved 5 February 2013. ^ "Sweden SAR takes first AW139". flightglobal.com. 2013-09-17. Retrieved 2013-10-28. ^ "AgustaWestland AW139 To Begin SAR Operations In Britain". aero-news.net. Retrieved 18 December 2014. ^ "Air Operations - AW139 Helicopter". lafd.org. Archived from the original on 23 January 2013. Retrieved 21 February 2013. ^ "Maryland State Police unveil new medevac AW139". helihub.com. 7 October 2012. ^ "Fifth and final AW139 delivered to New Jersey State Police". helihub.com. 10 July 2012. ^ "CBP Air and Marine Acquires Helicopters for Border Security Mission". cbp.gov. Archived from the original on 8 March 2013. Retrieved 21 February 2013. ^ "Lord Ballyedmond: NI peer among Norfolk helicopter crash dead". BBC News. Retrieved 30 April 2015. ^ "Helicopter crash leaves 4 dead after aircraft explodes near world's longest zip line in UAE". Fox News. 30 December 2018. ^ "Breaking: VP Osinbajo's chopper crash-lands in Kogi". 2 February 2019. Retrieved 5 February 2019. ^ "AW139 Technical Data". AgustaWestland. Retrieved 24 September 2015. Gajetti, Marco and Paolo Maggiore. "Route Profitability for Helicopters." Società Editrice Esculapio, 2013. ISBN 88-7488-609-8. Jackson, Paul. Jane's All The World's Aircraft 2003–2004. Coulsdon, UK: Jane's Defence Data, 2003. ISBN 0-7106-2537-5. Wikimedia Commons has media related to AgustaWestland AW139.